Each Monday Cathy at Rambling In The Garden invites us to share an arrangement using materials collected from our gardens. Today marks Cathy’s fourth anniversary of posting and hosting In A Vase On Monday and to celebrate she has challenged participants to create an anniversary contribution in something other than a vase. I pondered over this task a lot the past few days and finally chose a memento from my daughter’s childhood that I just happened upon yesterday. 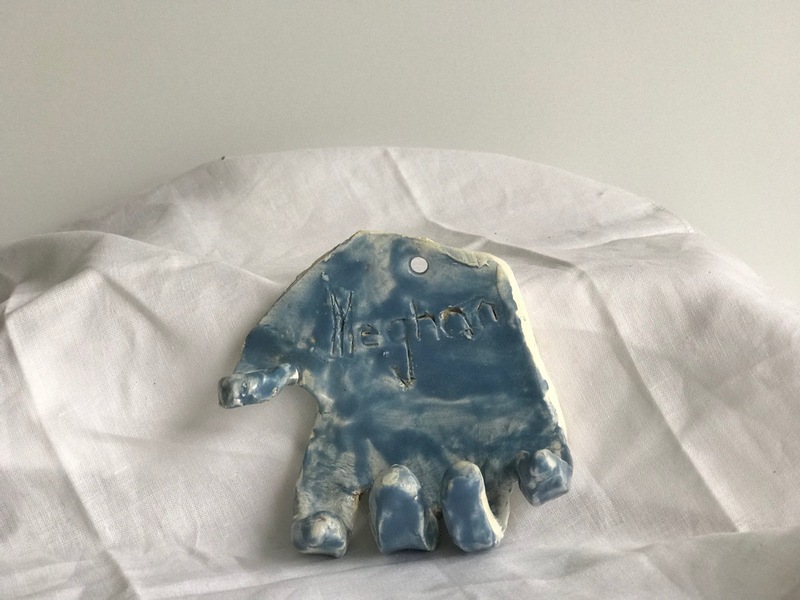 This blue glazed hand was traced in clay from her own little hand for a very early elementary school project. Hooked onto the bathroom wall, it held her toothbrush for a time when she was a child. My idea for using the hand to hold flowers turned into more of a conceptual piece as time ran out to actually hang it on the wall. Instead I posed blossoms around it and took pictures from above. Although we had two consecutive nights of temperatures in the upper 20sF. on Sunday I was able to gather quite a few camellias, which I arranged and rearranged. Congratulations and many thanks to Cathy at Rambling In The Garden for hosting IAVOM with such enthusiasm. Visit her to discover what she and others found this week in their gardens on this vaseless Monday. 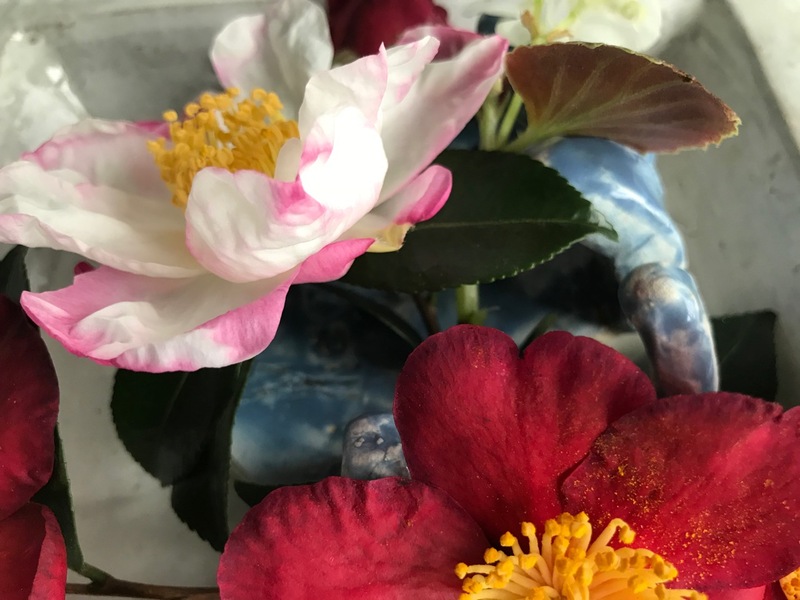 This entry was posted in garden and tagged 2017vase, Camellia sasanqua 'Hana-Jiman', Camellia sasanqua 'Yuletide', flower arranging, flower design, in a vase on monday, nature photography on November 13, 2017 by pbmgarden. What a lovely use for your daughter’s hand. I have several pottery ornaments made by my children when they were little and they are so precious. 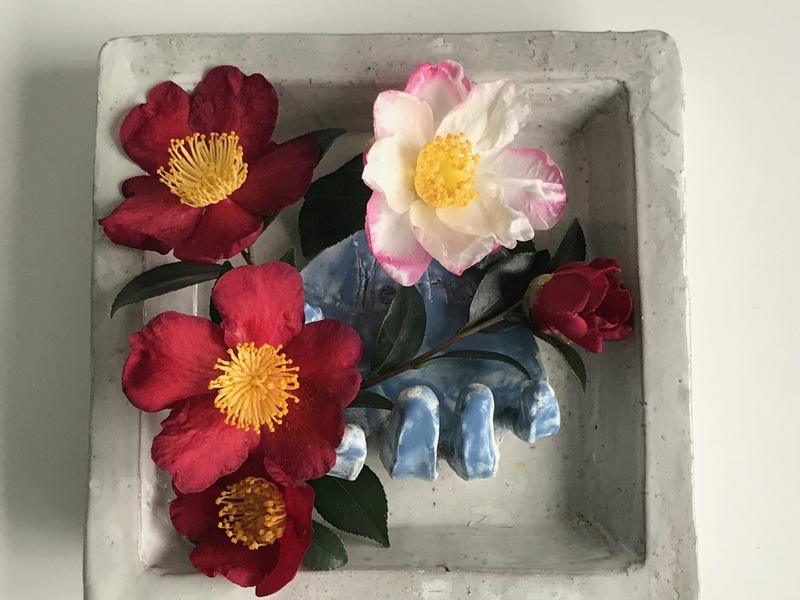 The hand looks lovely with your beautiful camellias. I admire them every year and enjoy them far more than the spring flowering ones. I have Camellia sasanqua but it is not nearly as pretty as your two. Thanks, aren’t those little childhood nuggets so dear. I’m coming to appreciate camellias more and more and in general, am looking to invest in more flowering shrubs. They give so freely and ask so little of the gardener. Oh, so sweet. Thanks Cathy. I can’t help being sentimental and holding on to little special reminders of our daughter’s childhood. Have a good week. Well thank you Cathy. Your anniversary challenge made me look at many objects around the house in new ways this week. It was fun incorporating this bit of nostalgia today. One of the nice aspects of blogging in general and IAVOM in particular, is having a chance to learn from each other in such a supportive manner. Enjoy your week! 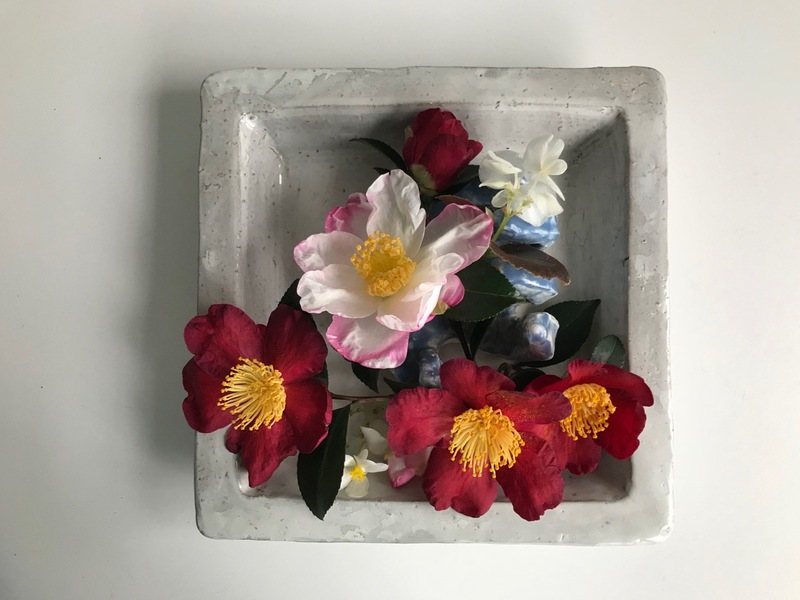 First I am impressed that you had camellias alive after such cold temps…..and oh what a beautiful display using your daughter’s hand….it really is quite breathtaking and very creative. Thanks Donna! Quite a few of the camellias showed sincere disdain for the cold, but others seemed unfazed. Such pretty camellias and your daughter’s little hand is very sweet. Thanks Peter. Blogger seems to be having a problem so I couldn’t leave a comment on your site, but your autumn coffee tribute is great. I wish I had two of those hands to put together in applause for your marvelous display. Hey John, thanks so much! It was fun to revisit these memories. Well done, Susie! I love the fact that you’ve held on to your daughter’s art piece and that you made such pretty use of it. It’s much better here than as a toothbrush holder. My own Camellia sasanquas are blooming more heavily now that our weather is cooler (nowhere near the 20s though!) but I wish I had more of a mix of colors as you do. Kris, thanks so much. I want more and more camellias. After taking them for granted all my life, I have come to love and admire them. I tried leaving a comment on your blog but Blogger seems to be having some issues. Your driftwood project is amazing, so professional! And Rosa ‘Medallion’ is a lovely, sweet color. What a sweet memento of your daughter’s childhood – and it’s practical use is quite appealing, not many crafts were more than decorative. 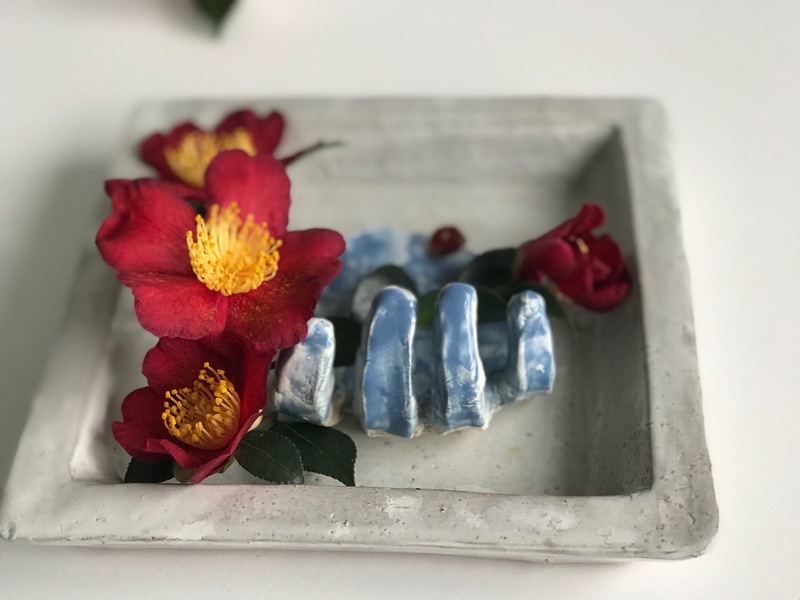 Your camellias are richly colored – ‘Yuletide’ gets me in the mood for the coming holiday! Thanks Eliza. My husband and I have such a hard time letting go of the many, many childhood notables so it’s rewarding to be able to include one today. Isn’t it hard to believe Yuletide is approaching quickly! Your flowers are very pretty and what a sweet idea. Thanks Alison. It is a treat to find a use for this special memento today. 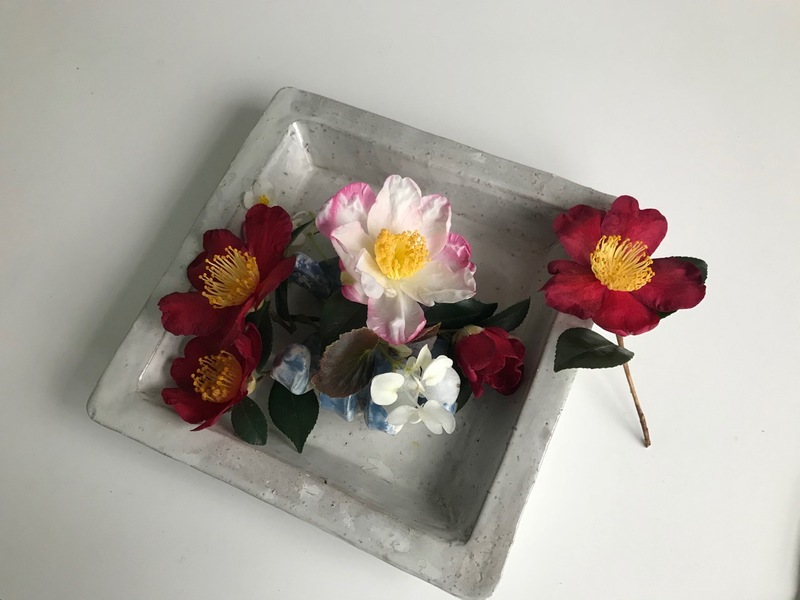 Such a lovely idea to use such a treasure from your daughters childhood and your camellias are beautiful It will be February at the earliest before I have any camellias to enjoy and even later if we have a hard winter. Thanks Julie. These fall blooming camellias come just as the rest of the garden is winding down. I have a japonica that blooms early March, but would love to get a few more camellias to fill in the winter months. Oh what a unique memento of Meghan’s childhood. A most moving and elegant arrangement Susie. I hope that ‘Yuletide’ hangs on to her blooms for some time to come. Thanks Anna. Yuletide seems early this year but actually is just about on time. I tried leaving a comment on your cute Monday vase but Blogger seems to be having a problem. We have a lovely little pottery shop near us where our grandchildren love to go to make alsorts of items, hands, feet and gifts for friends. Our daughter even had her dogs paw print made into a small pendant. Your hand is a lovely keepsake. Those items become so precious. You could go with them and do Grandpa’s hand! Thank you Annette. Hope you have a good week too and hope you’re getting some rain by now. We had some last week, but lake levels still have not recovered. You have managed to turn nostalgia on its ear and make of it an elegant unvase. Thanks Ricki, I do love the little childhood treasures. What to do with them but bring them out every once in a while! Nice Camellia blooms, and the hand is a nice touch. Thanks, it’s been a good fall for Camellias. What a lovely idea and beautifully executed. What a lovely idea. Our temperatures are forecast to drop below zero next Monday so I had better get out there and pick a few things. Thanks, happy to hear from you. I was still getting tomatoes until the temps dropped here. Should have been more careful to collect them ahead of time. Accomplished with your usual style, Susie. So beautiful! That glazed hand is such a wonderful momento of your daughter’s early years and I love the symbolism of it ‘holding’ your flowers. Camellia sasanqua has really had me drooling on everyone’s posts at the moment and ‘Yuletide’ looks like a gorgeous example (perfect against the pewtery blue). Thank you Cathy! 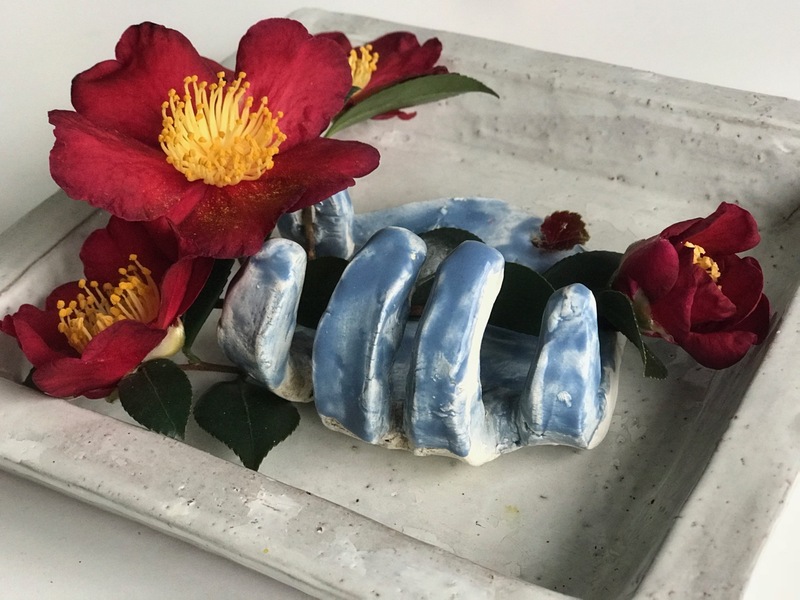 It was fun to incorporate the glazed hand into this anniversary vase. Yuletide is a very popular camellia in this area. What a simply beautiful arrangement and how clever to use your daughter’s memento so effectively. 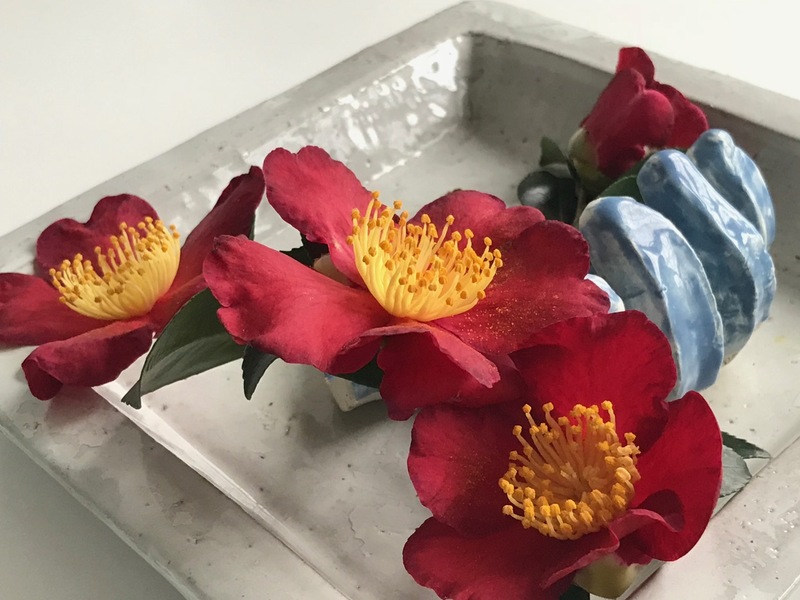 I first saw the Camellia sasanqua on your blog years ago and recall writing it down immediately. I haven’t got round to getting one yet, but your blooms are every bit as striking and memorable as the first time I saw them. Camellia sasanqua ‘Yuletide’ is especially easy to grow where I live, completely care-free. It’s wonderful to have shrubs that will flower just as other parts of the garden are winding down. Is the pre-Christmas flowering a trait of the sasanquas or a geographical effect of your neck of the woods, I wonder? My camellias flower in February (or not at all, depending on my luck!). Sasanqua camellias bloom fall and winter depending on variety. The japonicas bloom late winter and spring. Oh I do hope February brings you some blooms. I think mine are flowering about normal time for our area. Contemplating plants and renovating my perennial garden in Chapel Hill, NC.